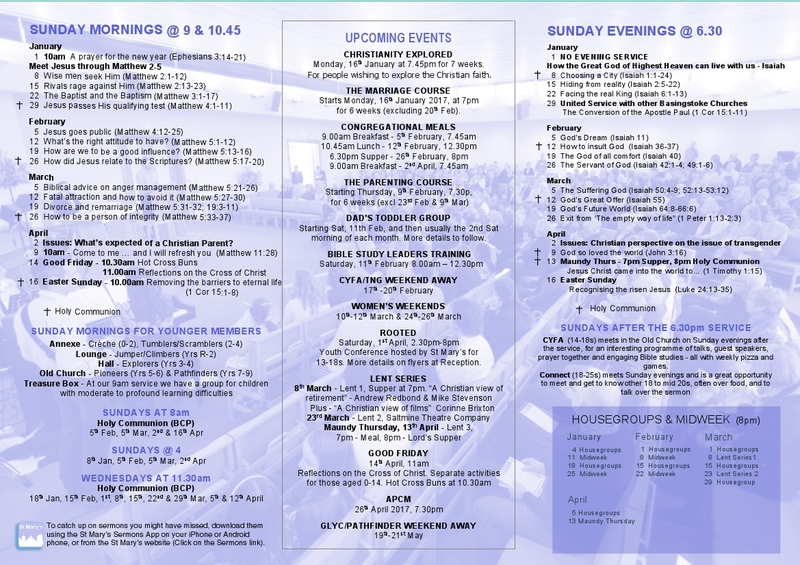 There is one morning service at 10am on 7th, 14th, and 21st April. Our services are at 9.00am, 10.45am, and 6.00pm. 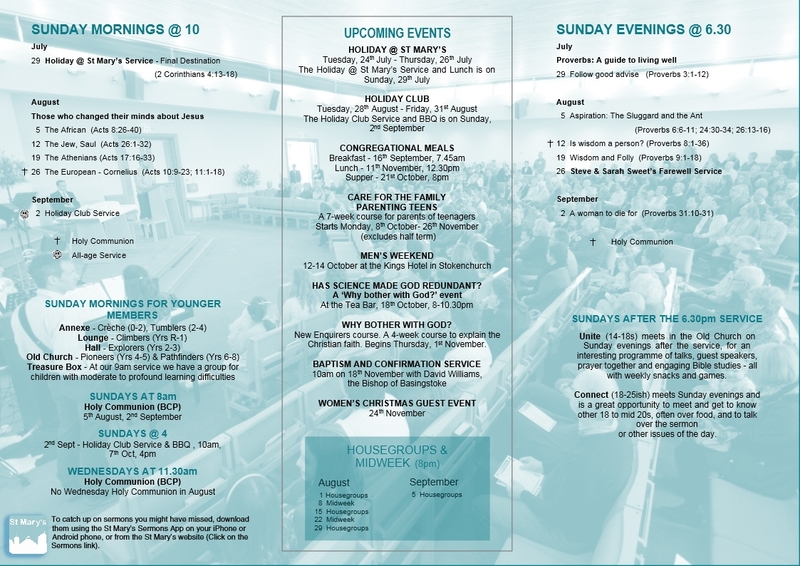 See what we're doing this term: programme card. 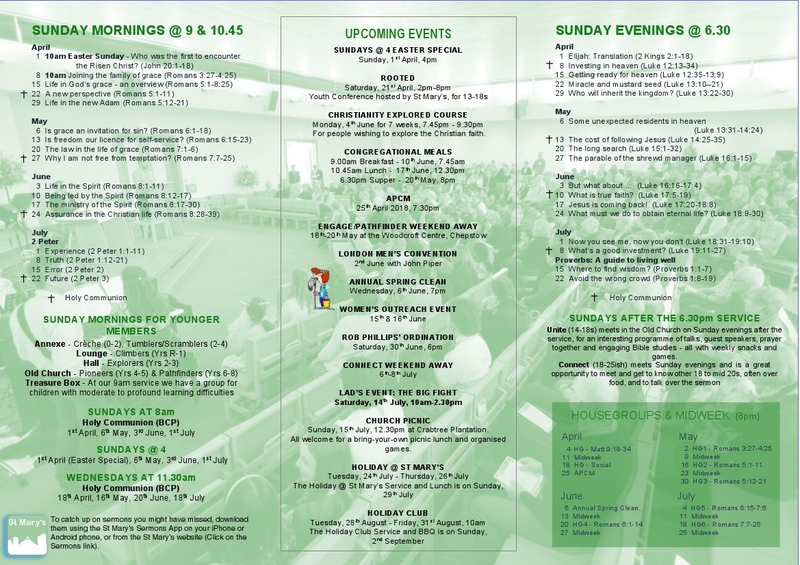 On the first Sunday of the month, we also have Sundays@4, an informal family service. We are a group of ordinary people of different ages and from different backgrounds. Many of us are from other countries too. What we have in common is that we want to learn more about growing in our faith and living our lives according to the way God teaches us in His Bible. You don't have to be a Christian to come and see what we are about. Refreshments are provided in the Hall after each service. This is a chance for people to catch up and meet new people. You could leave straight away but most people do stay. If you would like to know more about St Mary's, speak to a steward (those with badges), or enquire at Reception. Please stop by - we would be happy to meet you. Everything you need for the service will be provided for you on arrival so no need to bring anything with you. We don't have a dress code. Please feel free to wear what ever you feel most comfortable in. Jeans or suits - it's up to you. Most dress casually. It would be great (but not essential) if you could fill in a visitor card when you come. These can be found on the tables by the doors leading out of the main Auditorium. They help us to keep in contact if you would like us to. No collection is taken at any services. Our regulars contribute to the running of the church so our guests don't have to. Our morning services have a contemporary style with songs and hymns, a children’s spot right at the beginning (just before they go out to their own activities), prayers, readings and a sermon. We have Holy Communion once a month. The invitation is open to all baptised believers and there is no pressure to take part if you do not feel comfortable doing so. We have a service at 9am, which is then repeated at 10.45am. 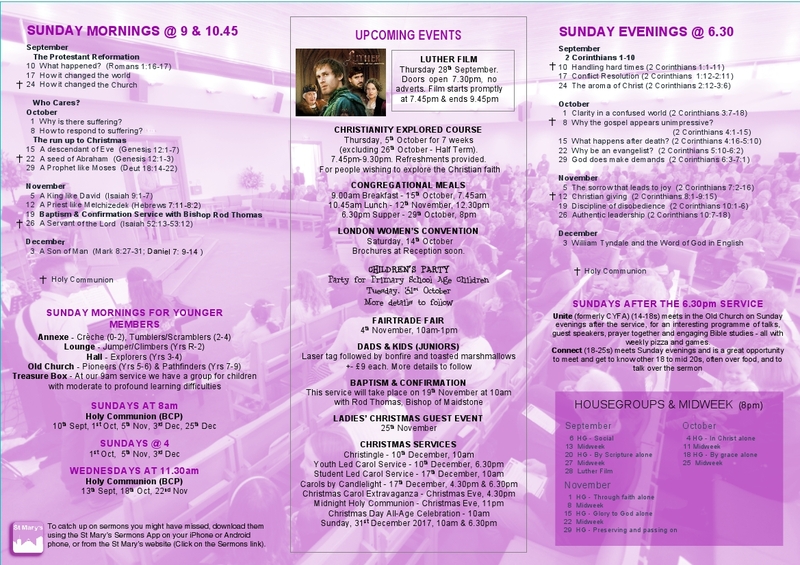 Both services are identical, so you can choose to attend whichever is more convenient. 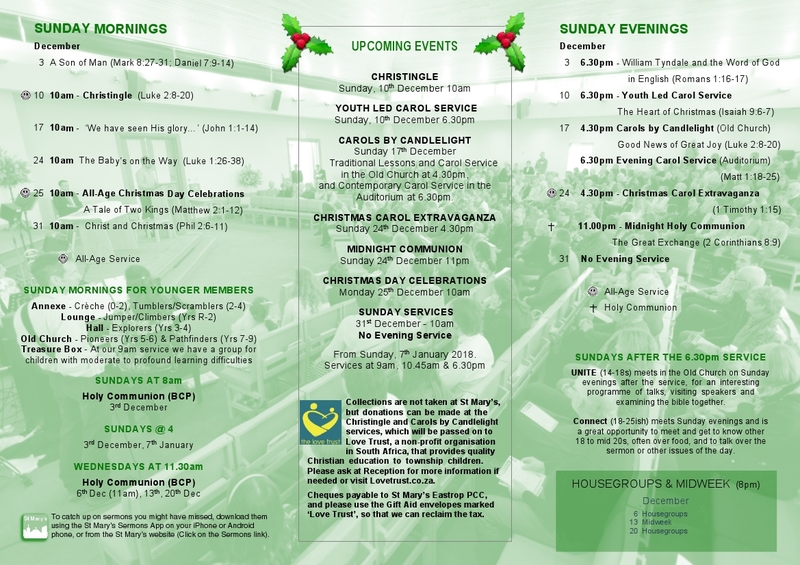 At certain times of year, such as Christmas and during the summer we may have a combined service at 10am. Check the Calendar to find out when these are. On the fourth Sunday of the month, there is a signer for the deaf and hard of hearing at the 10.45 service. See Accessibility for more. 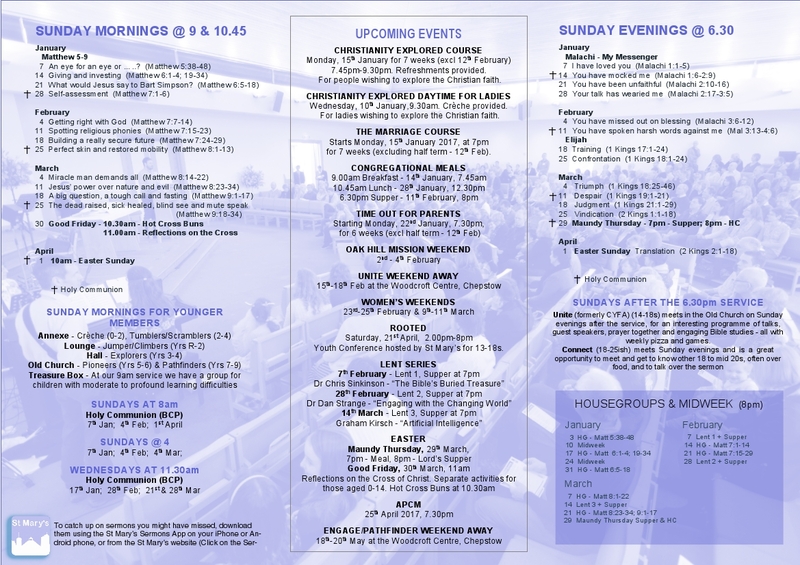 Sundays@4 happens on the first Sunday of every month. 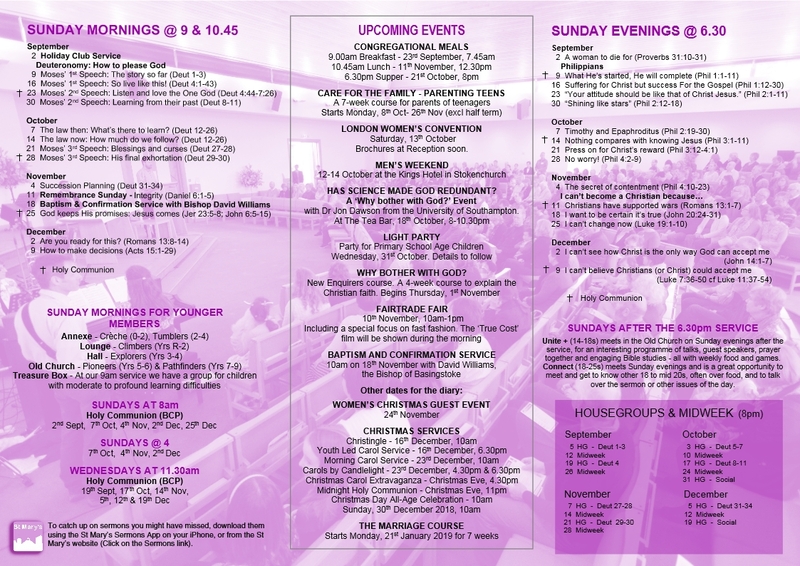 It's an informal service for all the family, including games, craft, fun, quizzes, challenges and a Bible talk. Tea will follow each service with sandwiches, cakes and drinks for all. 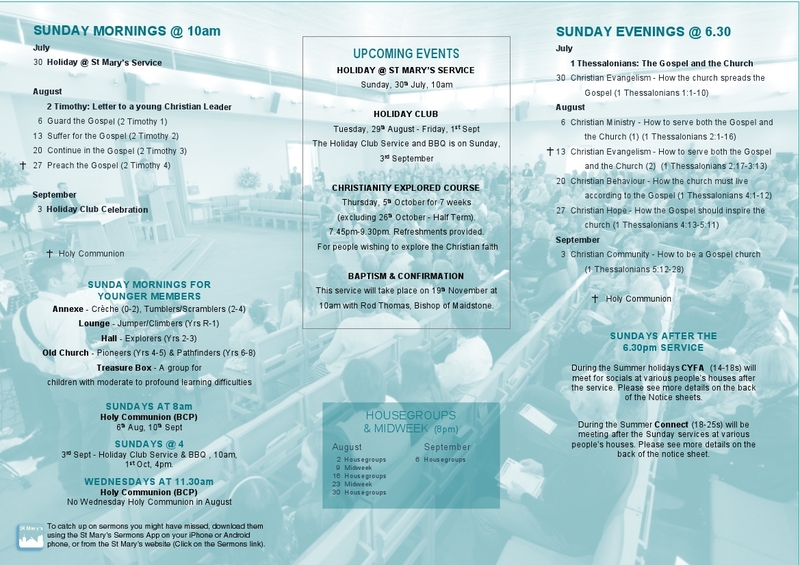 The evening service at 6.30pm follows a similar pattern to the morning services but there are no children’s (0–13) groups. 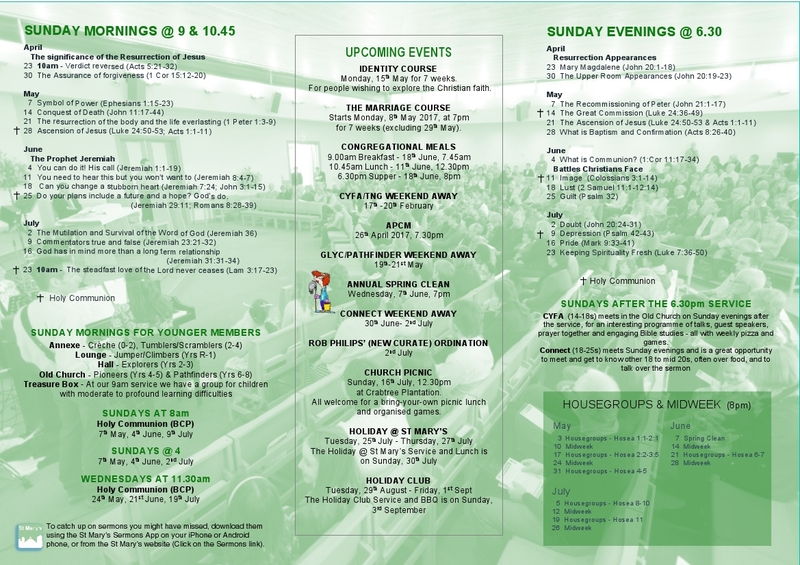 Because the young people’s groups (Unite — 14–18yrs) and (Connect — 18–25s) follow the evening service, there tends to be a large number of teenagers and young adults at this service. Children are an important part of the church family here at St Mary's and our aim is to teach the children about the Lord Jesus in partnership with their parents. They remain with their families for the first part of the morning services but after a song or two come down to the front for a short introduction to what they will be learning in their groups. Groups range from age 0–14. A creche is provided for children under 2 and starts from 10 minutes before the service although most are taken through when the older children leave for their groups. The kids groups are fun with games and crafts and learning about Jesus through being taught the true stories from the bible in a way that is relevant to their age. They are encouraged to share what they have learned with their parents after the service. The groups are led by experienced children's workers who have been DBS checked so your children are in safe hands. More details about our safeguarding policy are available here. Please ask a steward (anyone with a name tag) to direct you to where your child/children need to be.